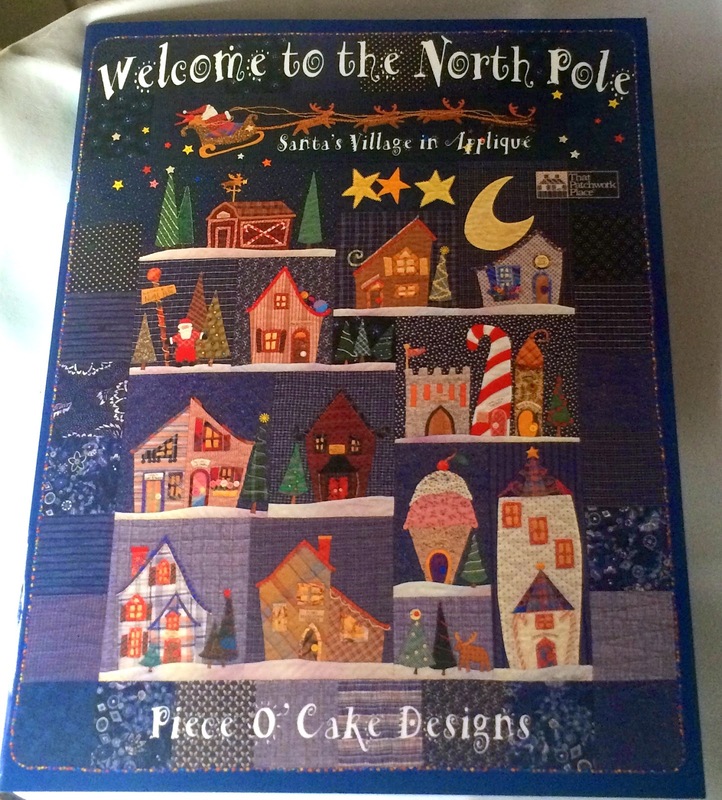 Welcome to the North Pole. Perlen,Samt und Seidentaft for some time now and she recently started a SAL. Well, I thought what a lovely idea and duly bought the book from Amazon. 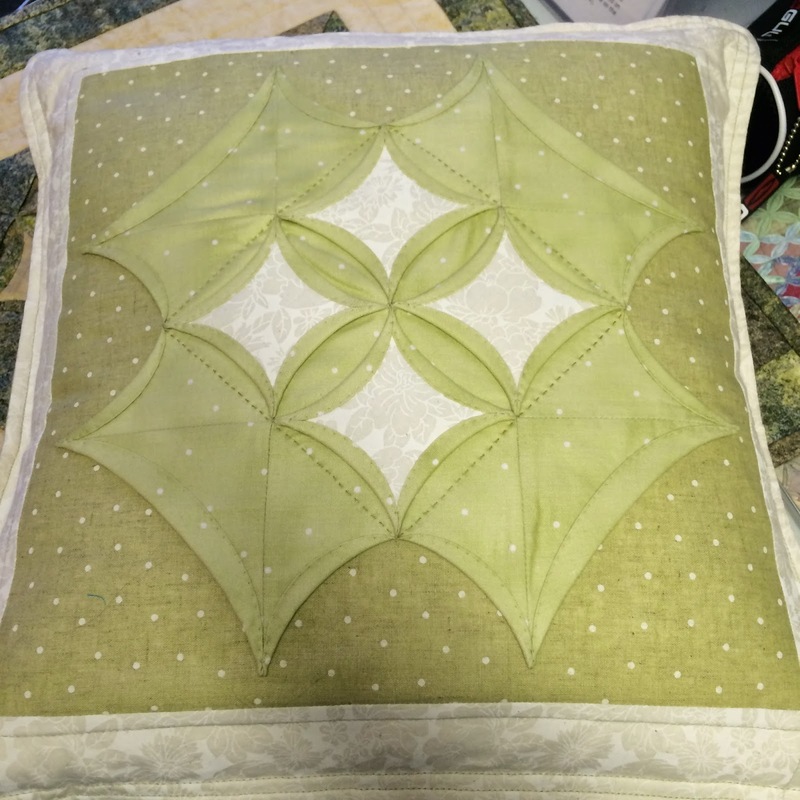 Also thinking a lighter quilt was needed for our little cottage, I have picked from my stash a line called Snowbird by Edeta Sitar. A mixture of cotton fabrics and batiks, and some linen for the background. It was bought awhile ago when it first came out and has been waiting for just the right project to come along. Well I think this might be the perfect project for it. 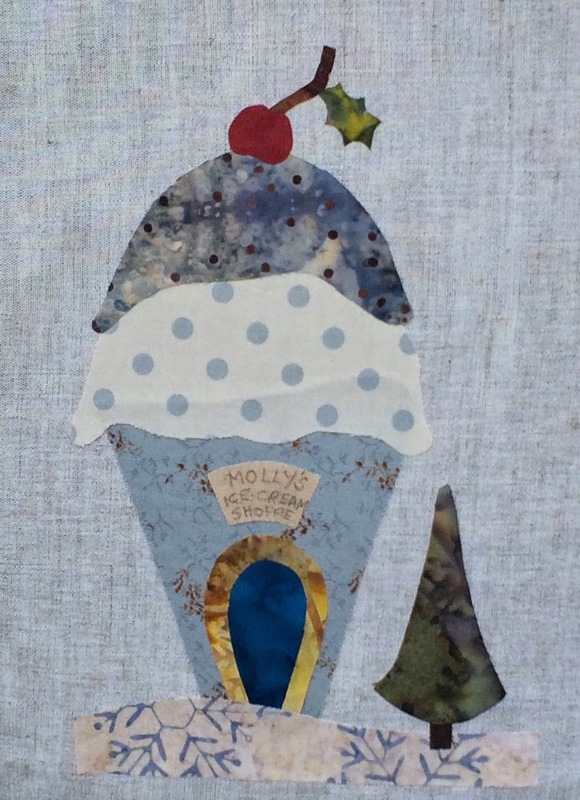 I could not wait to start, so this is the first block, Sprinkles Ice Cream Shoppe though I called it Molly's Ice Cream Shoppe. When Molly my granddaughter was very little she saved her penny's to take me to an ice cream shop, she will probably have forgotten by now as she was very young. I do think this fabric will be perfect for this project,very cold and chilly. I do also have a finish. The cushion started in Lynne Edwards Class, and yep I am pleased, looks great on the old chair. I did intend to make two but I need to catch up with the North Pole blocks :0)..
You can find Christiane's blog, in the blogs I follow on the right hand side. Do go and have a look. Things are indeed progressing but very slowly. 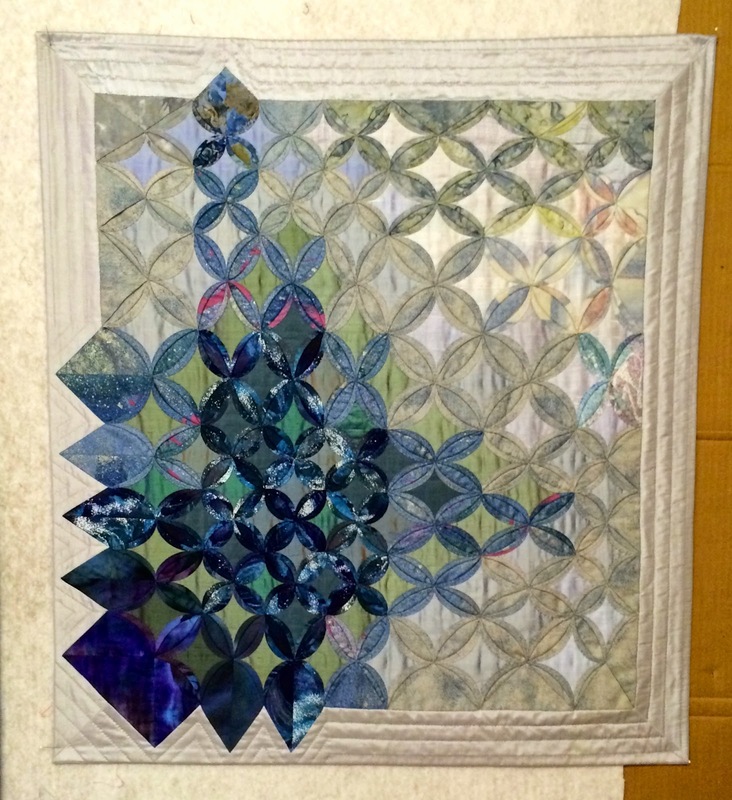 I am hand quilting the Floral Impressions Quilt, and as I said before, this could take some time. 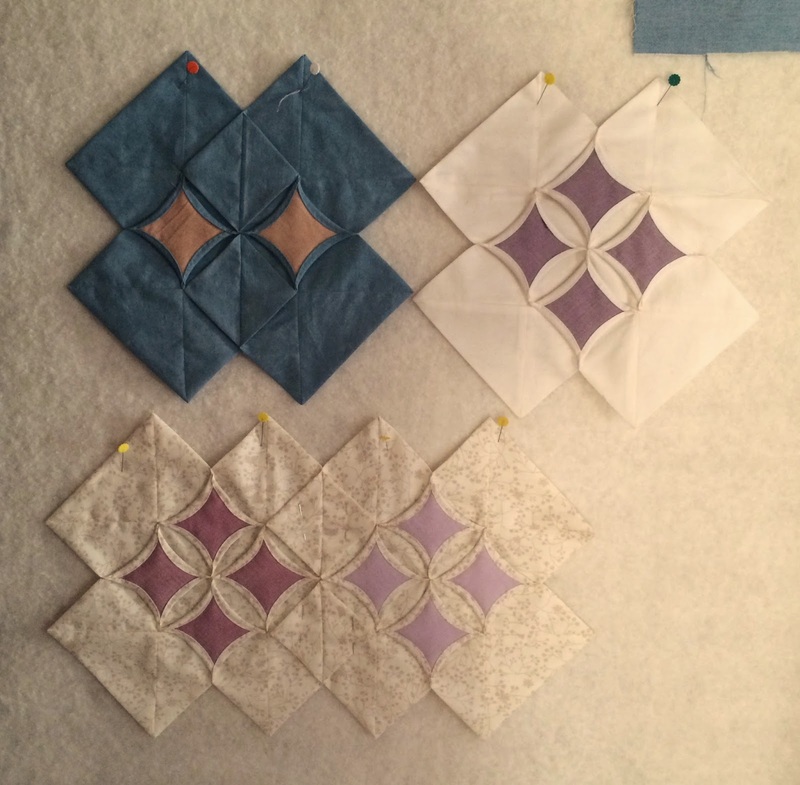 I have been playing around with some blocks that I learned at the Lynn Edwards Day. I am liking the ones at the bottom at the moment. 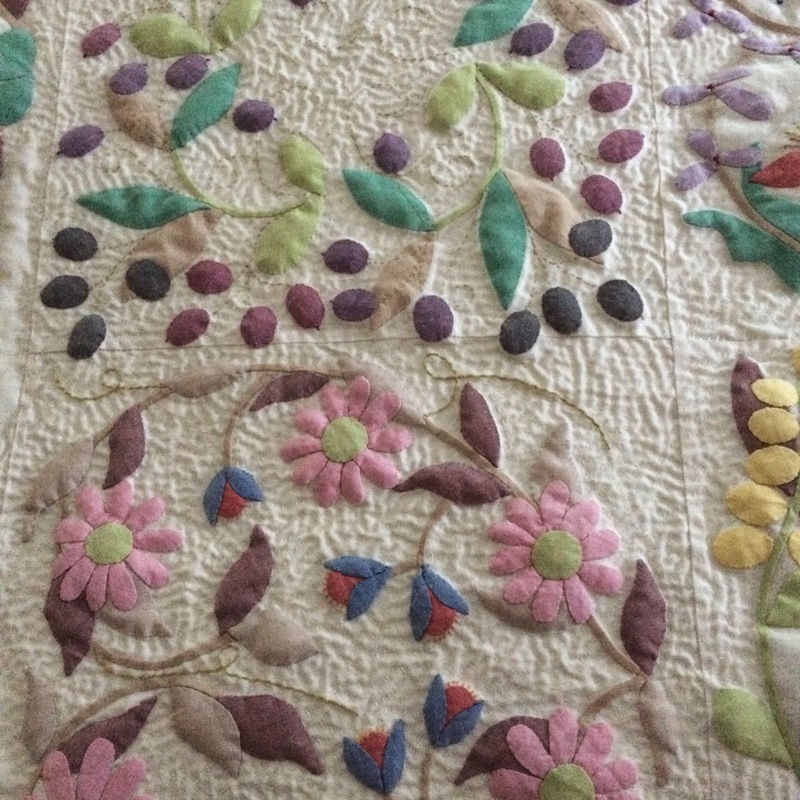 It is fabric left from the Floral Impressions quilt. 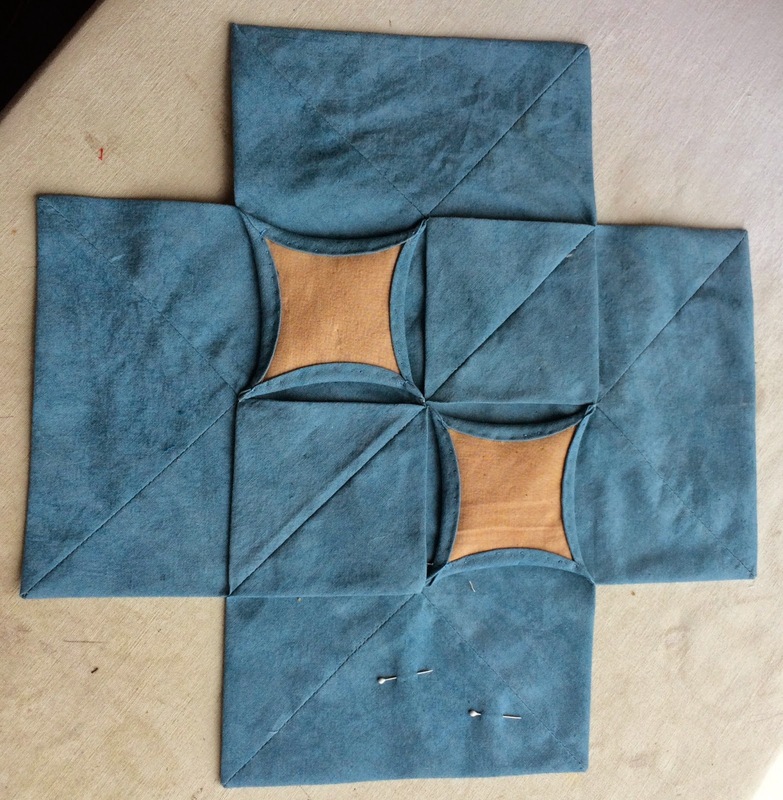 Sorry the photo is not very good, I am using the backing fabric as the main fabric this time as it's so pretty. One of the Siblings Together 2 tops is put together and needs to be sandwiched with wadding/batting and then quilted. 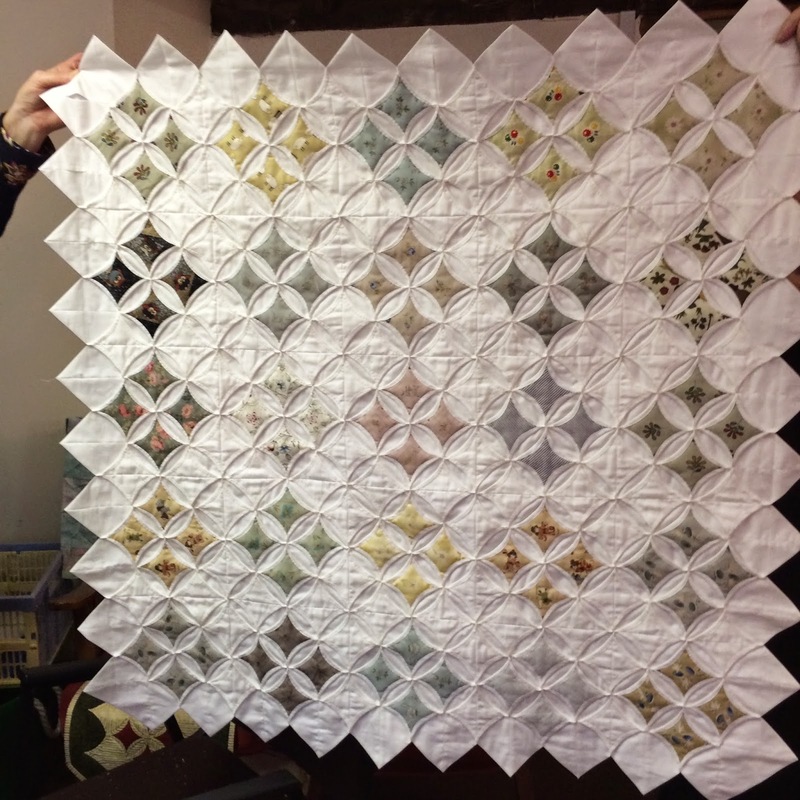 This is going to be a machine job after all the hand quilting I am doing at the moment. Things are definitely progressing along though very, very slowly. 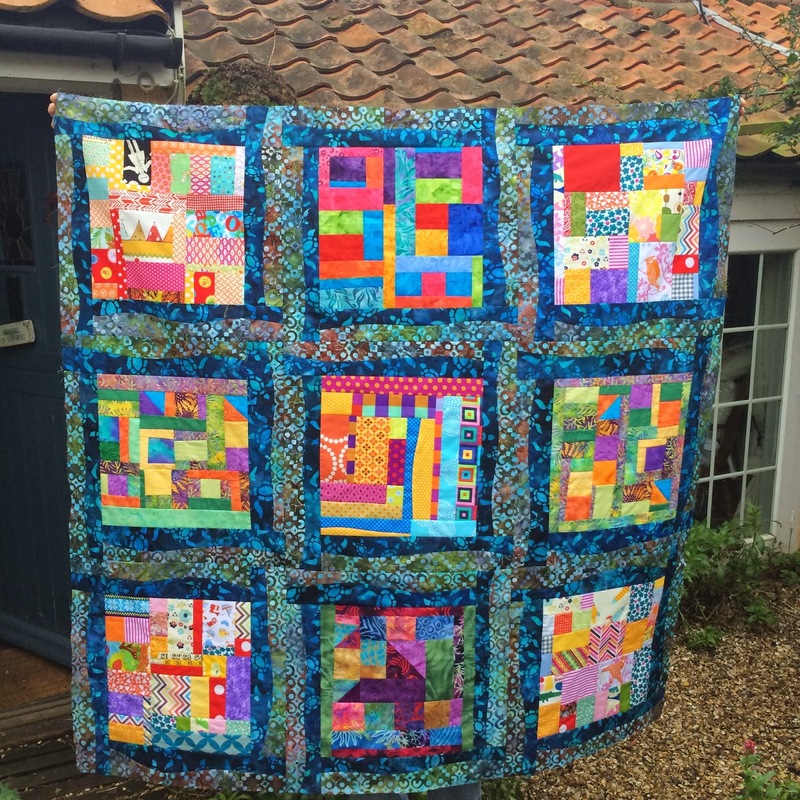 Sew and So's of Bungay. This is what we were aspiring to achieve or just even one of her beautiful cushions. This however is all that I achieved , not even one block finished and it took me all day. :0)) But the inspiration I received was enormous. I have lovely ideas running all around in my head and I do hope they stay there till the New Year, when I intend to put these ideas to good use. 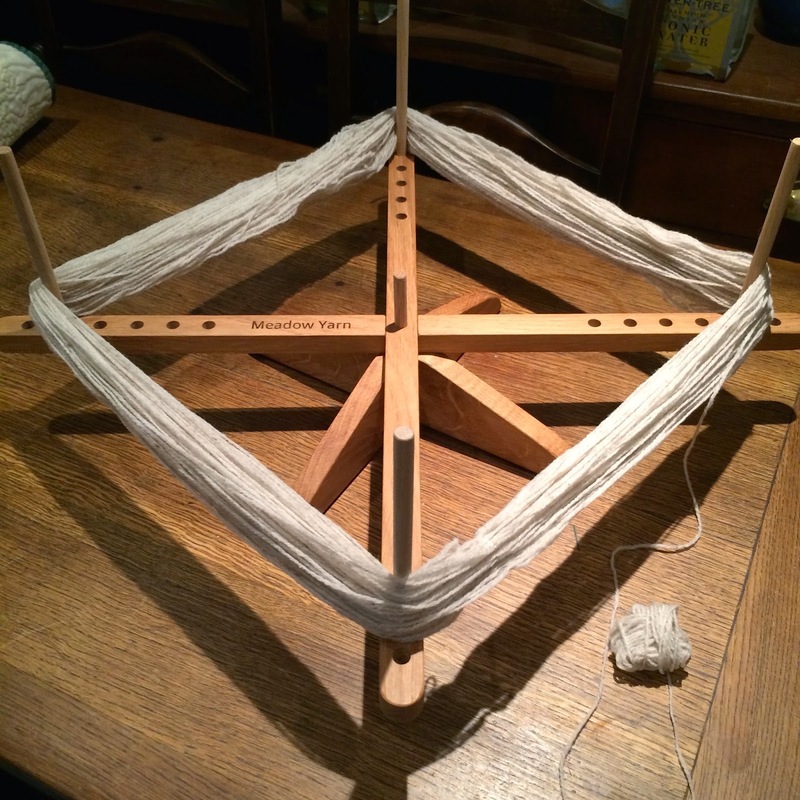 This was one of Lynn's work in progress and it is just lovely. I might just finish the block I made on the day and turn it into a cushion. One can never have too many cushions can they? Though it was scrap fabric I am quite pleased with it. Mr M and I are going to put our Christmas tree up today. I do however loose my ironing space in the sewing room, but it is only for a short time and I am hoping it will make me feel a little more festive..